I consider the Sphinx as belonging to the trove of imagery which constitutes the visual representation of our culture. It is possible that images of Sphinx exist in more Australian family archives than any other object, monument, or location (except maybe Uluru or the Big Banana). This painting depicts a brave woman of the Australian Army Nursing Service. 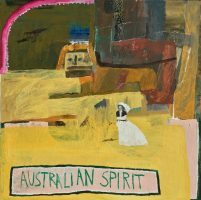 She is sitting on a camel smoking a pipe of Australian Spirit. Throughout modern Australian history there have been a number of events which have shaped our culture. These include but are not limited to; the disappearance of the Beaumont children, Azaria Chamberlain being taken by a dingo, Gough Whitlam, and the Luna Park ghost train fire of 1979. Unlike Nolan’s softened geometric abstractions of the park in the early 40s this painting presents a somewhat more violent and tumultuous representation. These works depict locations observed by Captain Cook from the Endeavour during his voyage to approve or refute Terra Australis Incognita (1768 – 1771). Kurnell was Cooks first landing place and was to become the failed first settlement location in 1788 in Australia. 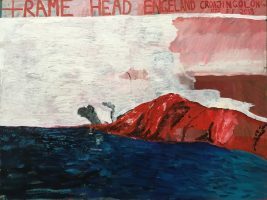 Rame head (from the old English spelling of Ram) is a headland near Eden, NSW, named after its resemblance to Rame head, Plymouth, UK. This was the last landform sighted by the Royal navy leaving the British Isles, or the first upon their return. 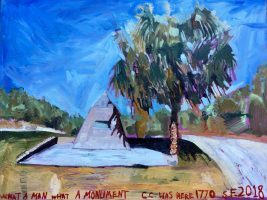 The monument to Captain Cook in Seventeen Seventy, QLD, marks the point of old mates second and final incursion onto Australian soil before leaving the newly proclaimed territory for Batavia. Like the Merino sheep breed the Australian Shorthorn is considered a triumph of Australian ingenuity. The beast is highly regarded amongst farmers for its docile temperament, reliable weight gain, and high fertility rate. 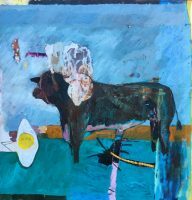 There is also an egg in the painting which is the other main ingredient in an ‘ozzie’ burger along with beetroot and sometimes pineapple. The smoking shoulder is a Vanitas. 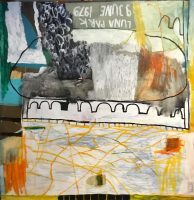 More works and info about Sam’s first solo exhibition Have One On Me, click on link below…..